Do you know what I did this weekend? First I spent most of my Saturday with my brother-in-law at Ikea. He is finally moving out of the parents home into his own place and wanted my opinion on a few things. Then on Sunday I sat with him planning and color scheming the possibilities we had for the interior. OK that was not really the story I wanted to tell you. I wanted to tell you that I have been so headless lately that I actually forgot my purse at Tom's parents place. My wallet, mobile phone, driver's license - the whole lot. So, I was penniless, unreachable and could not officially drive for the past two days. Imagine a woman without a credit card! It was terrible. Besides being so headless I was a bit down this weekend too. This year the Diwali thing really got to me. As I watched all my Indian friends prepare for the feast and party I wanted to be a part of that feeling so bad. Just being with my family and enjoying, laughing and eating good food. Golly I thought I was kind of prone to all that. But obviously it still gets to me. That's the disadvantage of living so far away. I never missed this in Qatar or Dubai because it is just like living in India. Presumably, since I never actually lived in India at all. In Weimar I must be the only Indian. So no one who I can bond with when it comes to such festivals. Maybe as I get older I am trying to grasp at my roots a little more. These things never bothered me before. Now, I look at Soeren and see that I am able to offer him so little of his Indian culture. He is half Indian but is living a 100% European life. I do my best to show him a bit of my Sikh religion, a bit of the Punjabi passion (although I think that has been inherited in the genes LOL). It is hard because I myself am so out of touch with that. We listen to Hindi music with a crazy passion and I am to bring my iPod with me everyday when I pick him up, so that we can listen to the tunes in the car. Those are the happy and great moments. Anyway, I really hope those who celebrated had a great Diwali. Cherish these moments. After all that eating I am sure you will enjoy what I have in store. Even those who did not go into excess eating over the past few days, think of the feasts that are coming up in the next couple of months. I am sure you will appreciate this. I think it would also make a great side to the Turkey or roast you'll be preparing. We had this as is. A baked potato like nothing you have had before. The delicate filling of ricotta, chanterelle mushrooms, plenty of herbs and radish make this whole dish flavorful and appetizing. I find these to be the most flavorful of all sorts of mushrooms. Delicate and just delicious. The Morel mushroom might be the most popular of all mushrooms, but it is the Chanterelle that has the finest chefs in the world in a frenzy and prize above all. The Italians call it Girolle and Germany it is called Pfifferling. They are prized around the world for their fine and delicate flavor. The Chanterelle has a tough yet mild flavor and a bit spicy edge to it. It really has that distinct flavor of the forest - where it grows. The Chanterelle has a tender texture, however unlike other mushrooms it does not disintegrate easily. With whatever you serve the Chanterelles with it holds up its taste like a winner - cheese, tomatoes, fish and poultry or like here potatoes. Fresh Chanterelles should be clean and just about dry to the touch. When you hold them to your nose, the aroma should be fruity and spongy to the touch. There might be signs of the woods - pine needles or moss, just pick them off. Fresh Chantrelles should not be washed when not necessary. The best way is to brush them or just pick of any dirt. I use a kitchen towel and rub the dirt off. If they really are very dirty soak them quickly in salted water and as soon as possible to avoid storing them wet. Fresh Chanterelles keep in the fridge for up to seven days or up to a year in the freezer. Dried Chanterelles should be stored in a container, in a cool and dry place. Give Thanks and spread warmth around you. Join me fill up the table with dishes that you create as a special thank you to or for anyone special. In November I would like to invite you to my warm home to sit around a cosy fire, eat and talk about the things you appreciated the most this year. What are you thankful for this year? Pre-heat oven to 180 degrees Celsius. Scrub the potatoes clean. Brush the potatoes with olive oil and sprinkle some salt over them. Place on a baking tray and bake for approx. 70-75 minutes, depending on the size of the potatoes. In the meantime mix the ricotta with the lemon zest, 2 tablespoons of juice, salt, pepper, chives, chervil, cress and the radish in a large mixing bowl. Set aside. In a pan heat up some olive oil and fry the chanterelles quickly for 3 minutes on high heat. Add the spring onions and reduce the heat. Saute for 2 more minutes. Salt and pepper to taste. Slit a cross in the potatoes and pop them open by pressing on both sides. Fill with the ricotta herb filling and spread the chanterelles over the top. Enjoy with a chilled white wine. A potato with style, character and jam packed with flavors. This dish uses natures bounty in perfect harmony. Simple to make and sensational in taste. Tom and Soeren just loved this and did not even complain that there was no meat to go with the potatoes - Germans usually need meat with potatoes. Tom especially mentioned that even though there are lots of herbs the aroma of the chanterelle comes through perfectly, but not over-powering the rest of the flavors. If you do plan to make this as a side dish use smaller sized potatoes or slice the potatoes into an ovenproof dish and spoon the ricotta and chanterelles onto the potatoes. A great Thanksgiving side dish. A recipe for Weekend Herb Blogging at Fiber's 28 Cooks. I'm looking forward to that, Meeta! ooh! that looks fantastic! 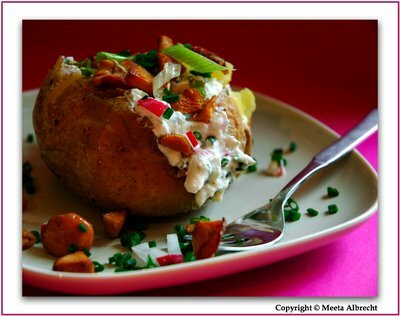 I'm a big fan of baked potato - simple yet really flavorful dish. Nice recipie Meeta,baked potatoes eh !! BTW thanks a ton for the German version of the mushroom,you see its a bit difficult to get all the German stuff into our diet with a little bit of Indian touch !! And I`m glad to say your blog helps me a lot..I tired your Baked Aubergine and its a regular at my home, but only thing, I dontknow where I get Garlic bread,so made roti instead !! I have tied Sehne and Frech Dax though ...anyway, thx a lot again,cant wait to try this Pfefferling..now I know what to pick when I go to my frischmarkt am Samstag ! Hi there,I found your blog some time ago, and I am hooked! Have never commented till now though. Sat sri akalji,sardarni! Munda changa hai kya! ( stupid Southie trying to greet you and the kid in Hinjabi:D) Don't mind me,just had some coffee! 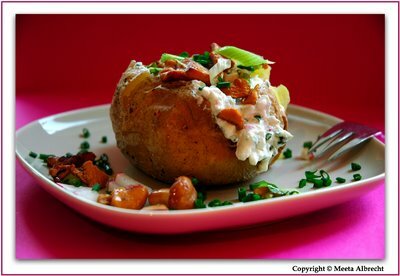 Love baked potatoes.I also top with chili con corne,cheddar,sour cream and chives.Meeta, it's 50F,I NEED that! Ahh..
awww...don't worry Meeta! you are doing a great job keeping Soeren in touch with his roots from both sides. It is hard to teach the kids culture, when all they want to do is play!! But you have the right attitude and that is what matters. Hope you had a lovely Diwali! I am regular reader of 'The daily Tiffin'. You are great mom and that's what matters. Baked potato looks fantastic ! After reading how you felt about wanting your son to know as much possible about indian culture, I had a thought about it and and I am sure you do everything in your power to make your son a good human being and that is what counts. As he grows he can always visit India as many times as he wants and get acquainted with indian Culture. By giving Soeren food with an Indian touch to it, or real Indian food and music on a regular basis, helps. You might not see it now, but you will in a few years. What language do you speak with him? Some of my friends thought I wasn't Greek enough as I didn't speak the language well enough, until they say me dancing and tasted my Greek food. Culture is more than only the language. I just adore chanterelle mushrooms. Sounds very delicious. Much more creative than a usual baked potato. Your blog header is looking great too. You are all really lovely. I thank you for your wishes, sentiments and good words. Glad you liked the recipe! The photo of your baked potato was truly a visual, colorful feast for the eyes and heck, it looks absolutely delicious, too.